Now – I can imagine – the more or less expectable reaction to the title for somebody who is not into football will – naturally – be “David Who?” That will be David Alaba, of Nigerian-Filipino parentage, originally from Vienna, plays for the German Bundesliga giant Bayern München and represents Austria in international football. Now, they do say that it is a small world, don’t they? As things would happen, Mark Lester Padua – a former player of mine who currently lives in Vienna – just happens to live in the same neighbourhood as Alaba. As a matter of fact, the neighbourhood – or so Lester says – is roughly ninety per cent Filipino. Therefore, Alaba moves around in Filipino circles even in the present day when he does not have to be in Bavaria for his football. Make no mistake about it, Alaba is now among Bayern’s rising stars; and would have played in the recent Champions’ League final defeat to Chelsea were it not for a second yellow card in the semi-finals and an unfortunate suspension. Had he not been suspended, who knows what could have happened? Frank Ribery, the French international who prowls the left wing for Bayern, has gone public before in saying how comforting he found having Alaba supporing him on the left flank. The youngster was brought up by the youth system of his hometown club Austria Vienna before being discovered by Bayern. The German club gave him his debut at the age of 17 and more or less has become the club’s first choice leftback. 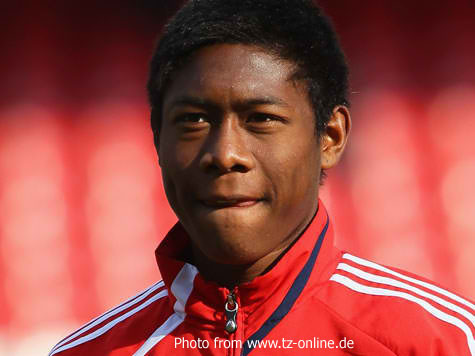 Alaba has acknowledged that he had been approached by Philippine football officials. The decision to pledge his international future to Austria, although he has no ethnic connection to the country, was probably the practical one. No approaches were made by the Nigerian FA. In spite of all his early successes, Lester says that Alaba is a very nice young man, someone who is very down-to-earth and has no star complex whatsoever. He does drive fabulous cars, probably provided by corporate sponsors. Lester used to talk to Alaba a lot more before his move to Bayern; but still sees him once in a while. It is Alaba’s sister Rose, Lester says, the he sees so much more of; and invariably because it is a small Filipino community. Also, Alaba’s Visayan mother used to visit them once in a while for a cup of coffee; and they would also occasionally return the courtesy. His father, meanwhile, is a musician who Lester told me is also very nice and down-to-earth. Lester agreed and added, “Nagmamano nga pô sa mga matatandâ!” This is the Filipino way of holding the knuckles of the elderly to the forehead to show respect to them. We both laughed. You cannot get more Filipino than that! Although, as a fan of the Azkals, what can I say but sayang!